I should have known. I was pretending I was better, but after 10 days of feeling weak and exhausted with a sore throat and cough that wouldn't quit, battling a headache that felt like I was being stabbed in the eyes, and experiencing alternating muscle sensations of pain and heat for no reason . . . I realized something was wrong. As mentioned in an earlier post, Daisy had the worst of it. She lost weight and gained a crazy bad attitude. Her younger sister figured out that if she slapped her in the nose, blood would pour out. How incredibly satisfying for a baby sister. Yesterday, I was convinced we had mono. Today, Daisy was diagnosed with Swine Flu and pneumonia. She's on antibiotics. My doctor's office isn't open on Saturdays but I'm feeling better for real . . . just low energy and a mild headache. My husband came down with it around New Year's and Violet has escaped unscathed as of today. The kids had one round of swine flu vaccinations but were supposed to get a second. I wonder if Violet will be next, or if somehow one round was enough for her. Anyway, none of this is very interesting. But you know what is? Transcend 2010. And here's what I'm going to do on that theme . . . 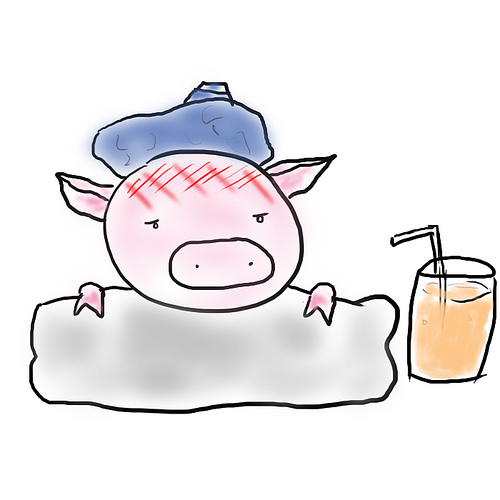 I'm going to take Swine Flu off the personal worry list. Been there. Done that. It wasn't great but it's almost over. As far as my worry list for humanity . . . I hope we can all look back and laugh at the piggy flu paranoia, but blessings to those who go through what we did or worse. Glad to hear you're feeling better. Sick children are one of the worst things to deal with. Hope Daisy feels better soon!